There are plenty of e-safety posters around for schools and children, but I wanted to create something that was very simple, differentiated by age and a little more up to date. They don’t cover every scenario but do contain the fundamental ‘stay safe’ principles for young children. The posters are A3 size in PDF format. If you’re a school feel free to download and use in school. For any other organization please contact me in the first instance before downloading/using. 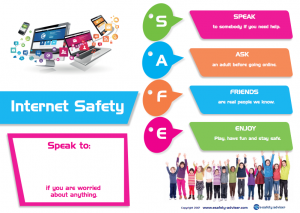 e-Safety Poster for younger (KS1) children. 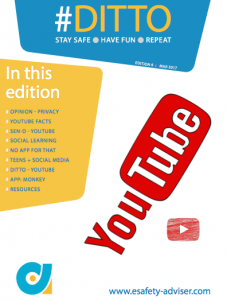 This uses the acronym SAFE which contains the basic, fundamental principles for younger children up to the age of about 7.
e-Safety Poster for older (KS2) children. This uses the acronym SMART for children from about 7 to around 11. It recognises that as children grow older, they’re getting smarter so need to be thinking much more widely and critically, but with the knowledge that they should still always ask for help. Blank e-Safety Poster for older (KS2) children. This is exactly the same as the above, but the text boxes are blanked out so that children can fill them in by themselves either as a class project or individually. You could also use this as a way of getting information out to parents where children show what they have learned in lessons. To subscribe to further editions please use the form below. Your details are kept private and only used to let you know when a new magazine is out, or for important updates such as new guidance documents, statutory guidance etc.